This 12 foot high sandstone cross is found in the old churchyard of Killamery (Kill means church) close to the Callan-Clonmel road. 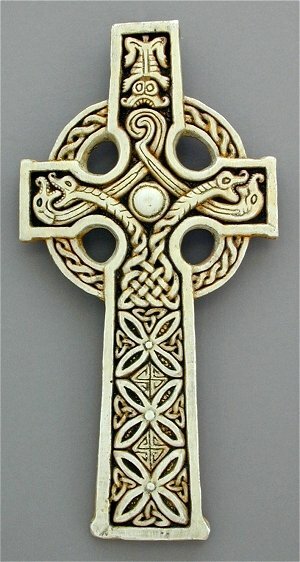 The center section of the cross has knotwork turning into two dragons. Another set of dragons ends in a spiral. The knotwork is a symbol of continuity, eternal life, and expresses the interconnectedness of all things. Dragons are thought to have the knowledge of the world. They protected the earth and all its inhabitants. These creatures can be also seen as snakes. To the Celts, snakes had great healing powers, and were symbols of rebirth. Snakes are usually shown in pairs symbolizing opposing forces: Life and Death, Good and Evil, Light and Darkness. The spiral symbolizes continuous creation and spiritual growth. The hound or Cu on top symbolizes the heroic. 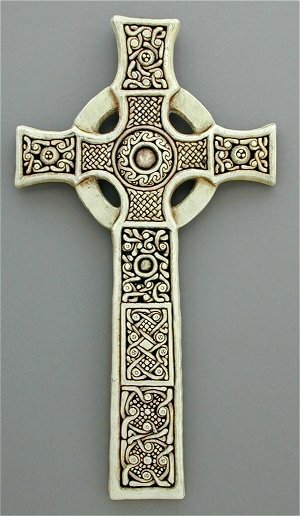 Although very old, this cross is not one of the ancient high crosses of Ireland. It does, however, echo the shape and design of those magnificent ancient monuments. The Harp Cross is located among the ruins of the Quin Friary and is approximately 11 feet high. Quin was founded as a Franciscan Friary in 1433. It was built in the ruins of a much older anglo-Norman castle. In 1541, King Henry VII dissolved the friary in his campaign to control the wealth and power of the church. Carved into the face of the cross is an Irish harp and scores of shamrocks. Both have become famous symbols of Ireland. The harp figures into many of the old Irish myths. The shamrock is from a legend about St. Patrick that says he used a shamrock with its three leaves to explain the Trinity, the triple nature of God. Above the village of Slane, the first Easter fire was lit by St. Patrick in 433 AD to symbolize the arrival of Christianity to Ireland. A monastery was built on the Hill of Slane in the 6th century, but little is known about it. The ruins atop the hill today are what remain of a Franciscan friary and college, having been ravaged in turn by Vikings, Normans and Cromwell’s troops. The Isle of Iona founded by St. Columba from Ireland, occupied a key position between Pictland and Northumbria on the one hand and Ireland on the other. The community of Iona had close links with Ireland in the 8th century and it is known to have been the meeting point of different artistic traditions. St. John's Cross, which has the widest span (almost 7 feet, 3 inches.) of any early cross in Britian, was originally without a ring and because of structural weakness, the ring was added in later. The cross is 17 feet tall and is from the 8th century. The panels of serpent and boss designs and 'bird's nest' bosses, and spiral work is very similar to that on the Chi-Rho page in the Book of Kells. St. John Cross represents rebirth in Christ. The 'bird's nest' symbolizes birth and the serpents represent rebirth since the snake sheds its old skin. Tobermory is an ancient medieval seaport at the top of the Isle of Mull. Across the channel is Lochaline, the site of a 14th -15th century stone carving school that was associated with the nearby Holy Isle of Iona. This cross design is of our own invention, but incorporates all the Celtic symbols (the unending knotwork, the maze and the spirals) and was inspired by this ancient place. The people of County Cavan have a saying: There is a lake in the county for every day of the year. The area around the small village of Killashandra is a pleasure ground for boating and anglers as well as pleasant walks. The waterways were once the 'highways' along which the early Celtic settlers traveled. The region was then densely forested. Their fortifications and burial sights are scattered everywhere. 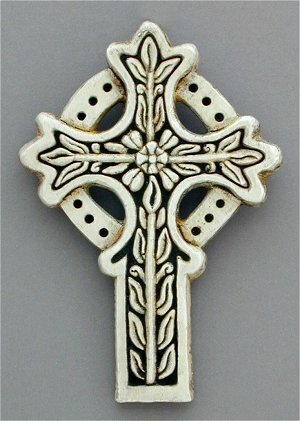 The cross has a triskel at the center which is a symbol of the Triune God, or the Trinity. The cap on top represents the small thatched churches of the early Celtic people. The shaft and the arms are delightfully covered with shamrocks, the symbol of the Trinity and an everlasting symbol of Oreland itself. Cross measures approximately 8.25 inches by 3.5 inches. May your purse alway hold a coin or two. 1) The Fall of Man shows Adam and Eve, and Cain slaying Abel alongside. 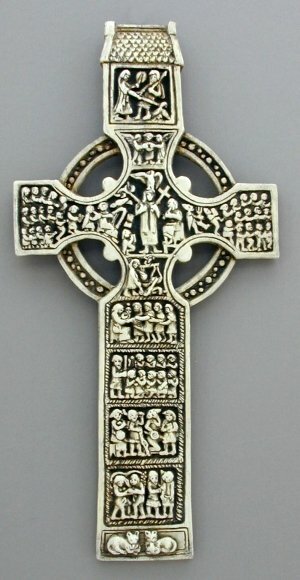 St. Martin's Cross was carved from a single slab of gray epidiorite in the mid to late 8th century. The most perfect of the surviving crosses on Iona, it stands in its original position where the monks of the island monastery placed it twelve hundred years ago. The cross, including its base is seventeen feet high and is carved from a stone that originally came from Argyll, Scotland. The raised circles, or bosses, are thought to represent God with everything revolving around Him. Intertwined between theses bosses are serpents, which in the Celtic work represented rebirth since the snake sheds its old skin; symbolizing our rebirth into a new life upon acceptance of Jesus. 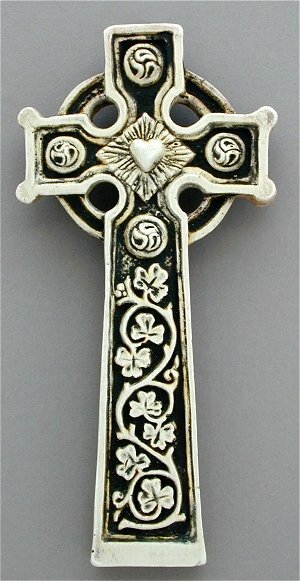 The ring around the cross head represents eternal life and is a common feature in Celtic Crosses.